I’m immensely honored to announce that This Modern World has won the 2013 Herblock Prize. 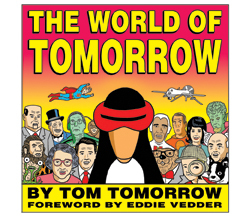 WASHINGTON, DC, February 25, 2013 â€“ Dan Perkins, pen name Tom Tomorrow, was named the winner of the 2013 Herblock Prize for editorial cartooning. The prize is awarded annually by The Herb Block Foundation for â€œdistinguished examples of editorial cartooning that exemplify the courageous independent standard set by Herblock.â€ The winner receives a $15,000 after-tax cash prize and a sterling silver Tiffany trophy. Perkins will receive the prize April 25th in a ceremony held at the Library of Congress. Jack Ohman, the editorial cartoonist for The Sacramento Bee, was named this yearâ€™s finalist and will receive a $5,000 after-tax cash prize. Gwen Ifill, moderator and managing editor of â€œWashington Weekâ€ and senior correspondent for â€œThe PBS Newshour,â€ will deliver the annual Herblock Lecture at the awards ceremony. Previous speakers have included Ben Bradlee, then-Senator Barack Obama, Sandra Day Oâ€™Connor, Tom Brokaw, Tim Russert, Ted Koppel, George Stevens Jr., Jim Lehrer and Garry Trudeau. Judges for this yearâ€™s contest were Matt Bors, a nationally syndicated cartoonist in altweeklies and winner of the 2012 Herblock Prize; Jenny Robb, curator of the Billy Ireland Cartoon Library & Museum at Ohio State University; and Steve Brodner, satirical illustrator who has covered eight national political conventions for Esquire, The Progressive, and others. The judges felt there were many strong portfolios in this yearâ€™s contest, including several animated-only entries and other alternative multi-panel submissions.